Gallery and comments » 1/72th - The age of chivalry - City life! 1/72th - The age of chivalry - City life! 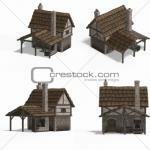 I launched into the creation of a diorama depicting life at 1/72th a street in the middle ages. Entertainment, everyday life, scenes that punctuate life dioramas. RE: 1/72th - The age of chivalry - City life! As always - great job! Very nice to see a picture "in progress"! No Mich I meant Valedemar with his comment. I am really look forward to see your city Mich! Le travail continue avec l'"habillement" d'une partie de la forge et la mise en peinture du sol de cette même forge. Work continues with the "clothing" part of the forge and the painting of the same soil forge. I love it! Great work! If you build a whole village like that this would be a kind of a perfect dio! Fantastic work, looks very, very lifelike!